Can we talk about the Avocado Crema? You have already heard that we should be eating avocados every day due to their health benefits. So here goes… You’re either an avocado lover or a hater, most people don’t seem to be happily ambivalent. 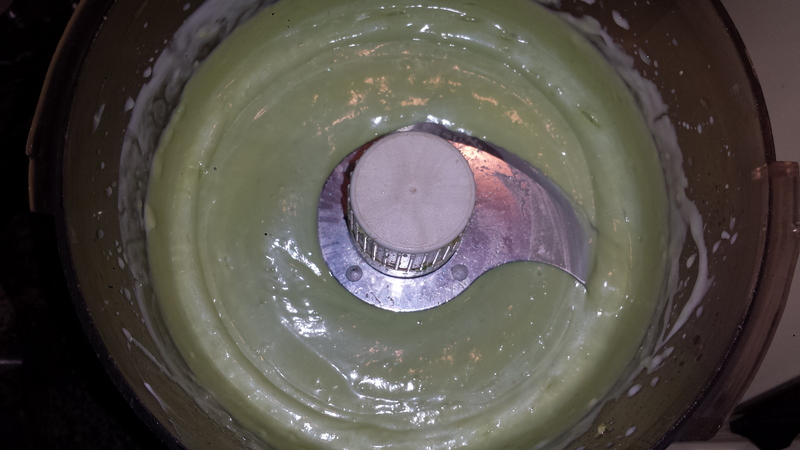 I am a total Lover and could eat this Avocado Crema all by itself. I mean, someone has to taste it… So delicious! 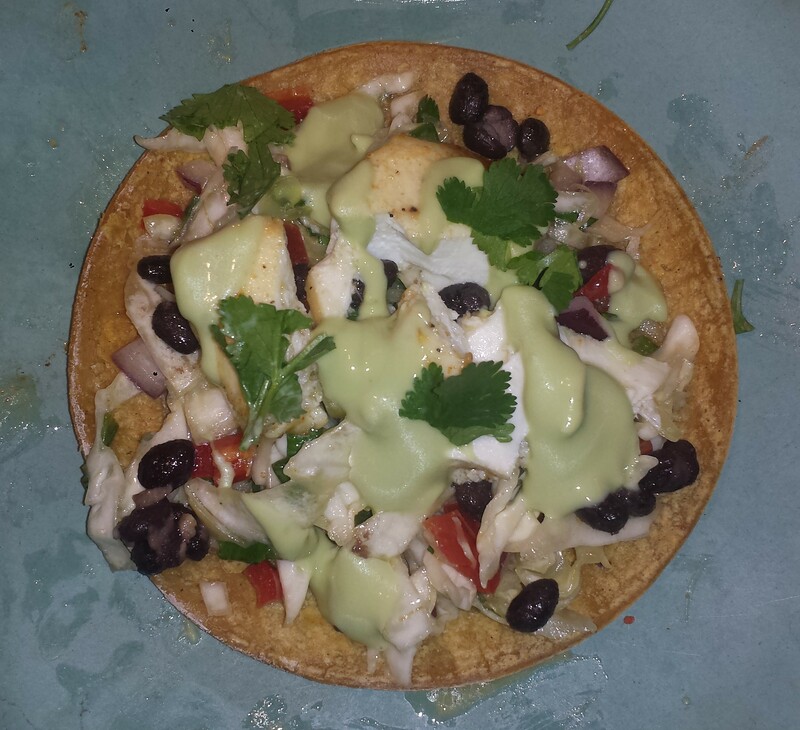 And it’s a healthy topping for practically anything, tacos, salads, roasted veggies…. Simple and just a few ingredients, including water. and it’s super easy to make in about a minute whizzed in a blender or food processor. Healthy, happy, looking forward to leftovers…Just saying. 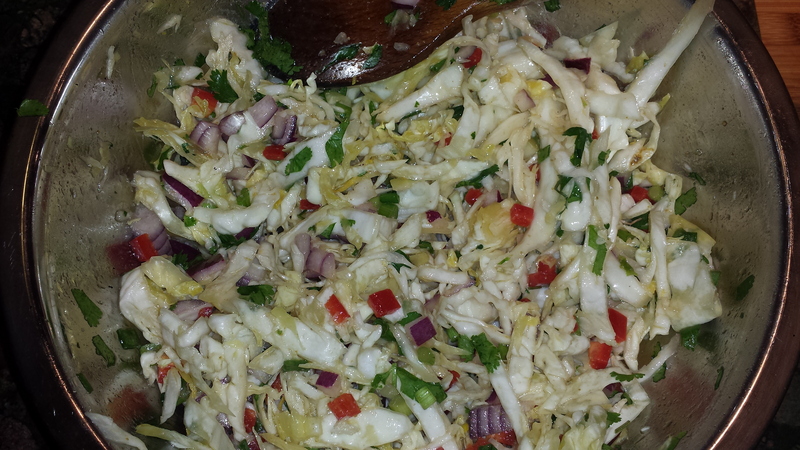 The slaw – my husband won’t come anywhere near the crema or anything else creamy, so this slaw is Jeff approved, crisp and spicy, tossed with olive oil, herbs and spices. I have gotten used to his peccadilloes regarding food and actually think that this is a more crowd friendly slaw as it is dairy free. 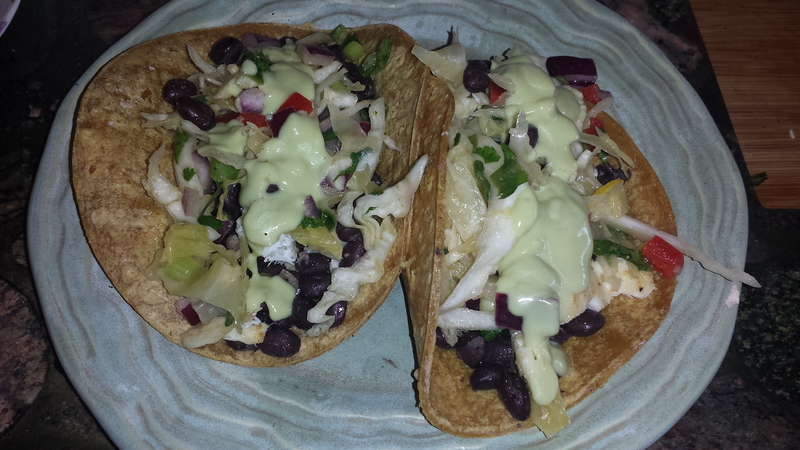 If you are setting up a taco bar, even vegan friends can participate, mixing the spicy slaw with the garlicky black beans, and if you use a dairy free yogurt, the avocado crema is just divine. A little Sriracha on the side is also not a bad idea. If you don’t like spicy jalapenos, substitute red bell pepper. If you like it extra spicy, use more jalapeno or an even hotter variety of pepper. 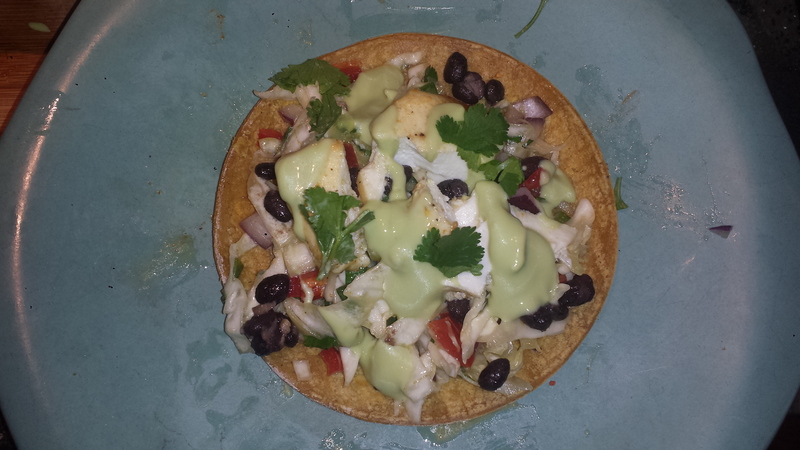 The beans – I add garlicky black beans to my tostada bar because I love the salty richness and extra boost of protein and all the lovely vitamins and minerals that they provide. They also give non-fish eaters something other than vegetables to put onto their plate. You could also prepare rice if you wish. 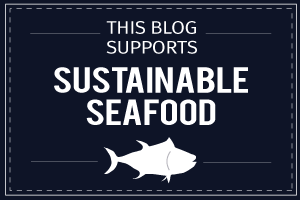 TIPS: When buying seafood, check out Seafood Watch who makes recommendations of what fish and shellfish are ‘healthy’ to eat and which are farmed or caught in a way that doesn’t harm you or the environment. 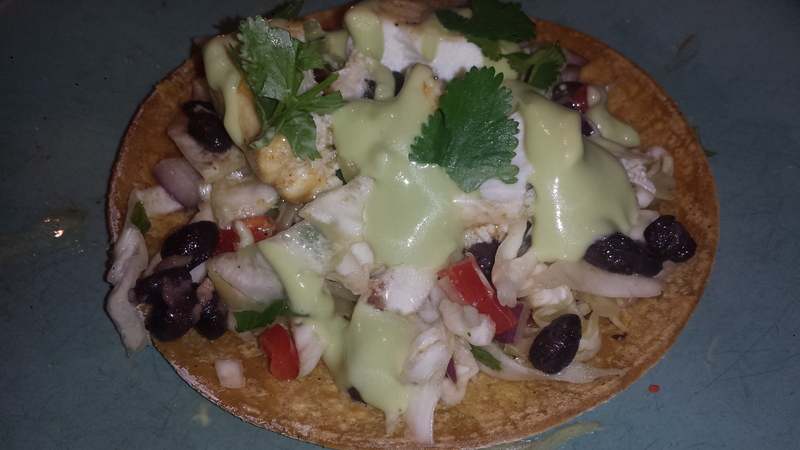 I used live caught California halibut which is considered by Seafood Watch to be a “Best Choice” option. 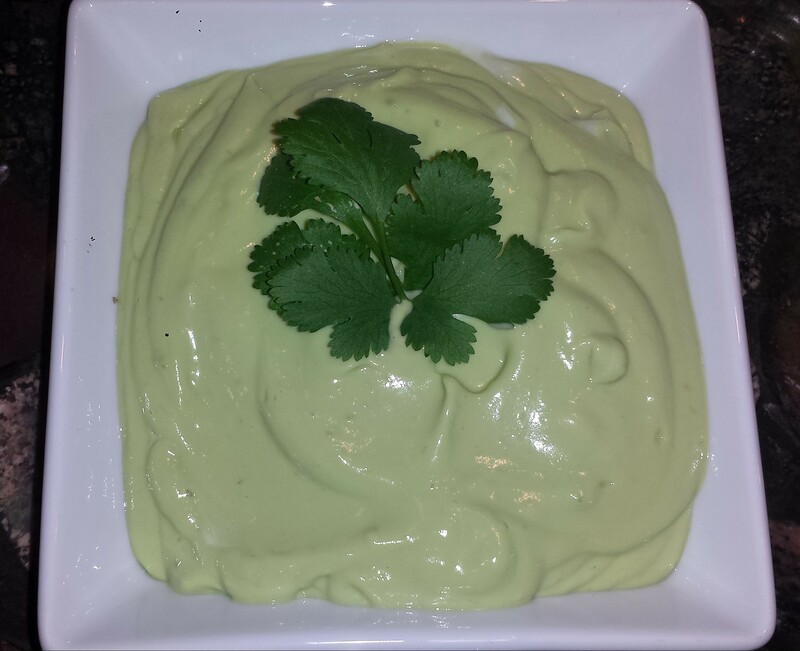 Halve and pit the avocado and peel or spoon the flesh into a food processor or blender. Add the rest of the ingredients and blend just until smooth. Add more water for a more fluid consistency. You can add a pinch of cumin as an option. I didn’t do so for this dish because I had already used cumin in other dishes. Transfer to a serving bowl. 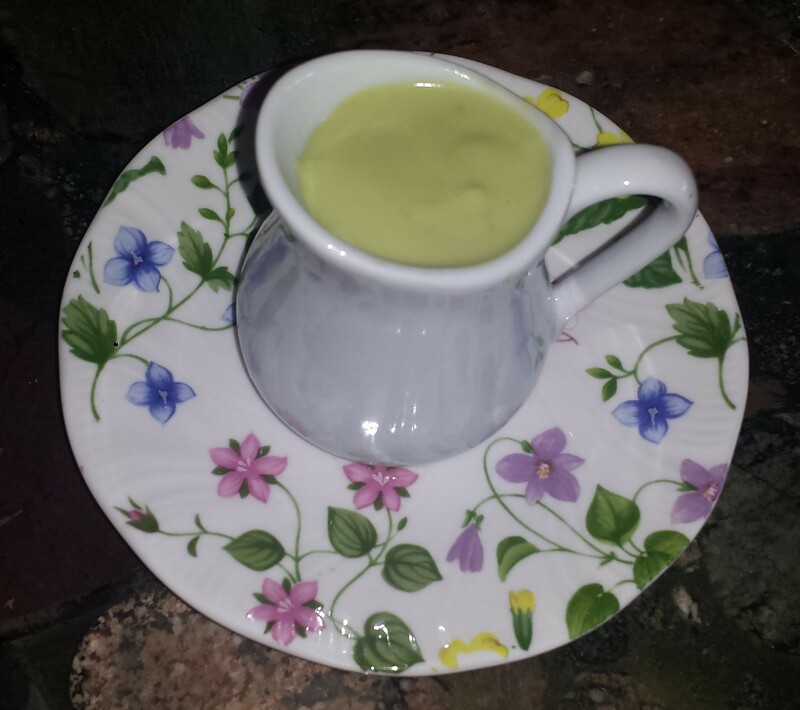 Serve thick with a spoon or thinner like a dressing in a container with a pour spout. Can be kept in the refrigerator for up to 2 days. Combine all ingredients and toss until combined. Refrigerate up to several hours before serving. 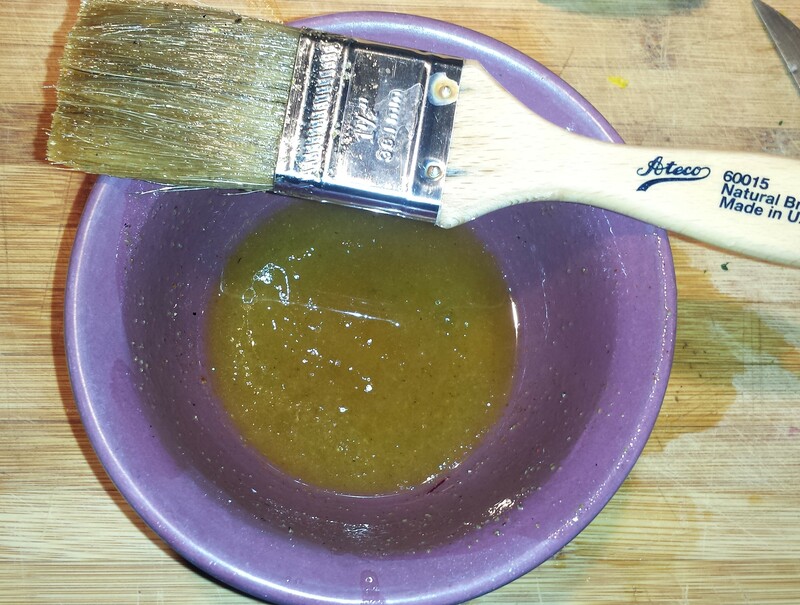 Combine olive oil, lime juice, sugar and spices in a small bowl. 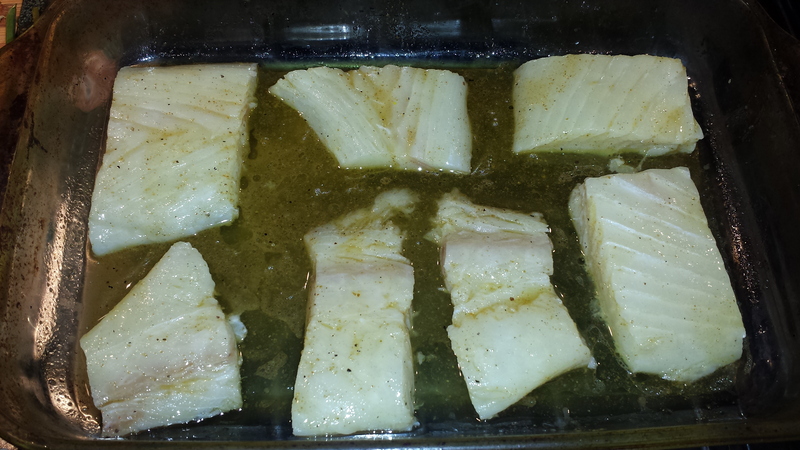 Wash and dry halibut filets. Cut them into smaller pieces, if desired, and place on an oiled baking dish. Pour marinade over the top of the fish and let sit at least 20 minutes. Turn the filets several times to coat both sides. 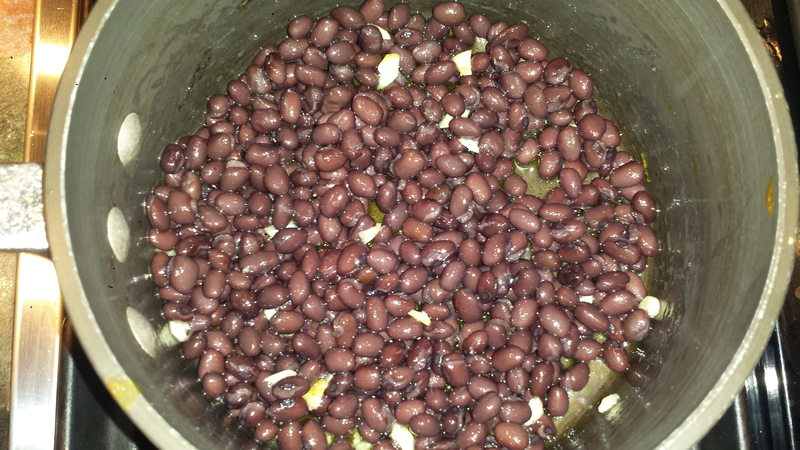 While the fish is marinating, heat the beans in a small stock pot with the garlic and olive oil. Remove from heat until ready to serve. 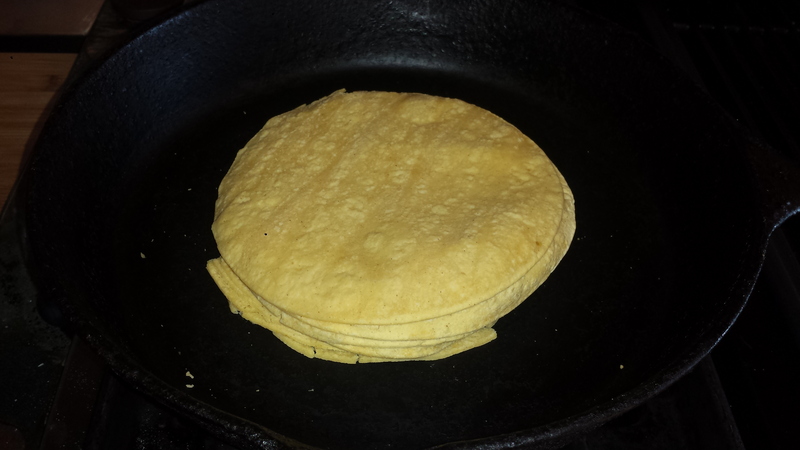 Heat tortillas in a covered cast iron or heavy pan on low until heated through, You can flip by quarters and thirds so the bottom doesn’t get too hard. Remove from heat and keep covered until ready to serve. If you like crispy tostadas, fry each one in oil on both sides a few minutes until crispy and let drain on papertowels. Broil fish 3- 4 minutes in top third of oven. Turn fish and broil another 3 to 4 minutes or until the fish flakes easily. Cover until ready to serve. Add the rest of the ingredients and blend just until smooth. Add more water for a more fluid consistency. Transfer to a serving bowl. Can be kept in the refrigerator for up to 2 days. Wash and dry halibut filets. Cut them into smaller pieces, if desired, and place on an oiled baking dish. Pour marinade over the top of the fish and let sit at least 20 minutes. Turn the filets several times to coat both sides. Heat tortillas in a covered cast iron or heavy pan on low until heated through, You can flip by quarters and thirds so the bottom doesn’t get too hard. If you like crispy tostadas, fry each one in oil on both sides a few minutes until crispy and let drain on papertowels. Turn fish and broil another 3 to 4 minutes or until the fish flakes easily. Cover until ready to serve.